Joe Murray was born in Cherokee, Iowa. He enlisted in the U.S. Army on July 24, 1962, and completed Basic Training at Fort Leonardwood, Missouri, and Advanced Infantry Training at Fort Polk, Louisiana. His first assignment was with the 1st Cavalry Division in South Korea from 1962 to 1963, and then with the 3rd Armored Division in West Germany from 1964 to 1966. During this time, Sgt Murray served as a 106mm recoilless rifle gunner, 81mm and 4.2 mortar squad leader, fire direction control computer operator for the 81mm and 4.2 in mortars and the Davy Crockett Missile System, and finally as a mortar section sergeant of an 81mm mortar platoon. In July 1966, Sgt Murray joined Special Forces, and after completing initial training in operations and intelligence, he was assigned to the 5th Special Forces Group in South Vietnam as an Intelligence Sergeant in the 4th Corps Mike Force as an Airboat Section Leader, Reconnaissance Team Leader, Indigenous Company Commander, and Battalion Commander. SSG Murray returned to the U.S. in 1968, and served with the 6th Special Forces Group in OCONUS Mobile Training Teams teaching foreign nations from the Middle East, Far East, and Europe. On November 21, 1970, SFC Murray participated in the Son Tay Raid to rescue American Prisoners of War being held in North Vietnam. His next assignment was as Team Sergeant of a High Altitude Low Opening (HALO) team in the 6th Special Forces Group, followed by service with the 1st Special Forces Group on Okinawa, taking part in operations in 9 different countries including Vietnam, Cambodia, Laos, and Korea. In 1974 he again returned to Fort Bragg, North Carolina, and held the position as Operations Sergeant, G3 Plans Division, John F. Kennedy Center and later as Operations Sergeant, Current Operations Division, G3, 18th Airborne Corps. Upon promotion to Master Sergeant, he became the Chief Operations Sergeant, G3 Plans and Emergency Deployment Readiness Exercise Division, G3, 18th Airborne Corps. In 1978, MSG Murray was assigned to the 7th Special Forces Group as a Team Sergeant and was promoted to Sergeant Major in February 1982, assuming the duties as Company Sergeant Major of A Company, 1st Battalion, 7th Special Forces Group. He and his company assisted in training a battalion of El Salvadorian troops at Fort Bragg and in June 1983 was deployed with his company to build the Regional Military Training Center in Trujillo, Honduras, to train new battalions of El Salvadorian and Honduran soldiers. In November 1983, SGM Murray was assigned as the Chief Enlisted Advisor to the Commanding General, 28th Infantry Division and also the Chief Enlisted Advisor for Enlisted Affairs for the Adjutant General of Pennsylvania. In 1988, SGM Murray returned to Fort Bragg to assume the duties as the School Sergeant Major for the United States Army John F. Kennedy Center and School and served as advisor to the Deputy Commanding General and Commanding General of the school until his retirement from the Army on August 1, 1992. After his retirement, Joe attended Campbell University where he received a BA in History. He and his wife Diane have two daughters-Melissa Ann Williard and Victoria Lyn Gill; and 4 grandchildren-Benjamin Murray Williard, Jared Michael Williard, Brianna Marie Gill, and Haley Nicole Gill. 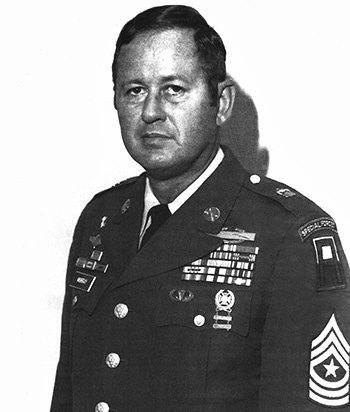 Sergeant First Class Joseph M. Murray, United States Army, distinguished himself by gallantry in action on 21 November 1970 as a member of an all-volunteer joint U.S. Army and Air Force raiding force in the Joint Chiefs of Staff directed heliborne assault mission to rescue United States military personnel held as prisoners of war at Son Tay Prison in North Vietnam. Sergeant Murray was assigned the specific mission of clearing key buildings outside the prison compound. Upon debarking from the assault aircraft, in which he was riding, he came under fire from an enemy force armed with automatic weapons. He returned fire on the enemy's position, neutralizing it. Upon reaching his objective, he came under fire from a building complex. With complete disregard for his personal safety, he assaulted the guard billets, throwing a grenade through a window. While doing so, he was wounded in the right leg. Sergeant Murray's daring skill, extraordinary heroism against an armed hostile force, and extreme devotion to duty are in keeping with the highest traditions of the military service and reflect great credit on him and the United States Army.